Although we can’t help you with the actual task (sorry) we can help to get your fridge prepped and ready to be filled with your favourite Christmas treats. Here’s some handy tips to keep it clean, keep it cold and where to store your foods ready for a cracking Christmas dinner! Obvious but important, your fridge needs to be kept at the right temperature in order to continue its genius work. 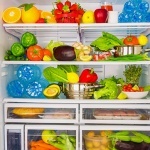 Experts suggest your fridge should be set between 1°C and 4°C so your food is maintained at 5°C or lower. This will prevent the growth of bacteria which makes food spoil and ensure your Christmas dinner is on top form! Is your fridge crying out for a bit of TLC? A regular clean will keep it in ship shape and prevent strong odours and spillages from affecting your foods. Your fridge should be given a spring clean every 3-4 months, whilst also keeping on top of spillages and regularly wiping down shelves. Adding a deodoriser is also a great way to eliminate odours and keep your fridge fresh and clean. To fridge or not to fridge? Make some much needed room by removing foods that don’t actually need to be there and replacing them with your favourite Christmas tipples! Foods such as sauce, chutneys and some fruit and veg such as potatoes, carrots and citrus fruits can be stored in a cool, dry place, rather than taking up room in your fridge. You can even keep your drinks cold by putting them in the garage or in a bucket of water or ice until they are ready to be served! This will save you bundles of room for your favourite festive treats. There are certain foods which should never be kept in your fridge to prevent the risk of bacteria and disease from spreading. Onions, tomatoes, bread, nuts and honey are among the foods that when refrigerated can lose flavour, grow mould and produce bacteria. Keep an eye out for which foods are best kept out and keep that space clear. Up Top – The upper shelves have the most consistent temperature in your fridge so here should live the foods that do not need to be cooked. This can be leftovers, deli meats, yoghurts or cheese. Down Below – The bottom shelves are the coldest part and therefore the ideal place to store your raw meat, eggs, seafood and dairy products that need to be kept cool. Draws – Fridge draws are designed to hold produce at specific humidities, so they are the ideal place to store fruits and veggies. This is also a good place to store herbs, as they can’t get frozen to the back of the fridge. Door – The door is the warmest part of the fridge. Here you can store foods that have natural preservatives such as condiments, jams and juice. Remember a fridge is for life, not just for Christmas! Follow these helpful tips all year round to keep your fridge in top chilling condition. For even more ways to love your fridge, read our 10 Fridge Hacks That Will Save the Day post. 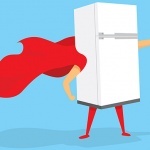 Keep an eye on our Facebook page this week for advice and guidance on solving those common fridge problems.